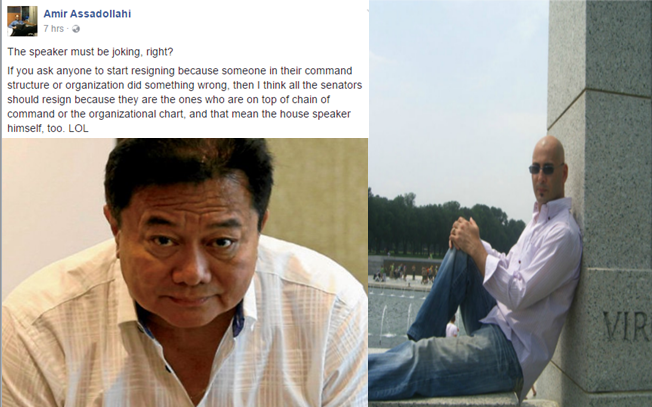 Canadian Politician and commentator Amir Assadollahi in his Facebook post, he expressed his disappointment to House Speaker Alvarez Pantaleon. The Speaker blaming and ask for resignation of Philippine National Police Chief General Ronald “Bato” dela Rosa after the killings of South Korean Businessman inside the Camp Crame. Amir said that if the speaker ask PNP Chief Dela Rosa to resign, then all the senators should resign as well because they are the ones who are on top of chain of command. Amir said that Alvarez rather than blaming General Dela Rosa, he should support the government in their push to speed up their cleanup efforts. He explained that the Philippine country has a huge structural problems like criminality, drugs and corruption, judiciary, police, military and businesses. Blaming the incompetence of the previous government. The speaker must be joking, right? Everyone in the world knows that the Philippine has a huge structural problems and there are criminality, drugs and corruption at all levels of government, judiciary, police, military and businesses. Thanks to incompetence of the previous government and the recent declassified CIA documents shows how bad that level incompetence was. The speaker rather than looking at rogue cops and blaming it on General Bato, maybe has to support the government in their push to speed up their cleanup efforts of all the cops who are involved in drugs, corruption and criminality and not hinder the job they are aiming to do by asking the ones who are doing the cleanup to resign from their post. Is that speaker on weed? Lacking commonsense as if he is high on something!